The Chromebook x2 is equipped with an Intel Core M3-7Y30 processor, 4GB RAM, and 32GB of internal storage. It has a 12.3-inch 2400x1600 display, with an aspect ratio of 4:3. For connectivity, you get two USB 3.0 Type-C ports, a headphone/microphone jack combo, a microSD card slot, 802.11b/g/n/ac Wi-Fi, and Bluetooth 4.2. The screen can be detached from the keyboard, turning it into a Chrome OS tablet. 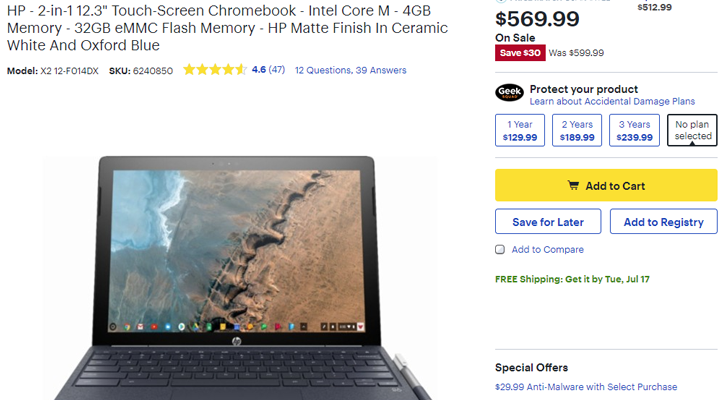 You can buy the Chromebook x2 from the source link below.